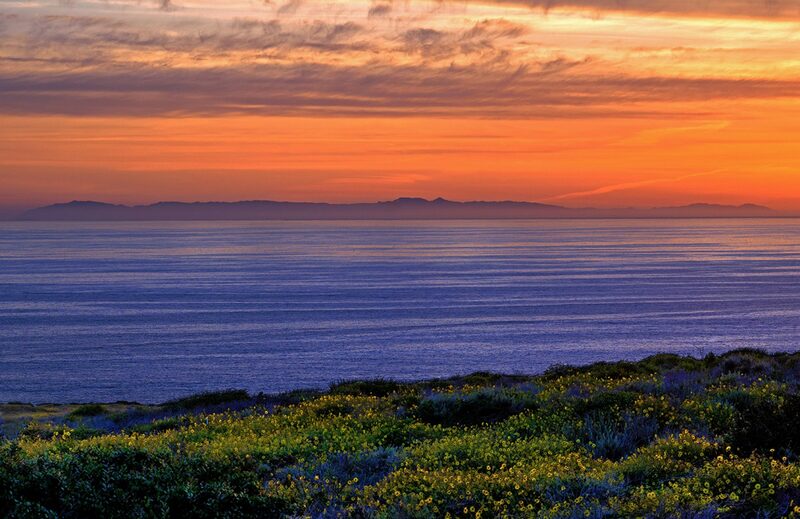 I wish I would have visited the San Diego Botanical Gardens just two hours earlier. Maybe I wouldn’t have man-handled my succulent that I was replanting because of a broken pot. The poor thing is either going to flourish in its new home or die a slow death. Coincidentally, two hours later while I am at the botanical gardens, a lady was speaking on how to plant and handle succulents. She taught the crowd about things to do and things not to do. My planting skills were on the not to do list. The informative seminar is one of a few that they had in progress on this warm spring day in April. Nearby, another woman spoke on the care of orchids which was perfect for my friend who had one sitting on her dining room table at home. I am sure she listened carefully to the helpful tips as to keep the beautiful flower the vibrant purple that it was in its current state. 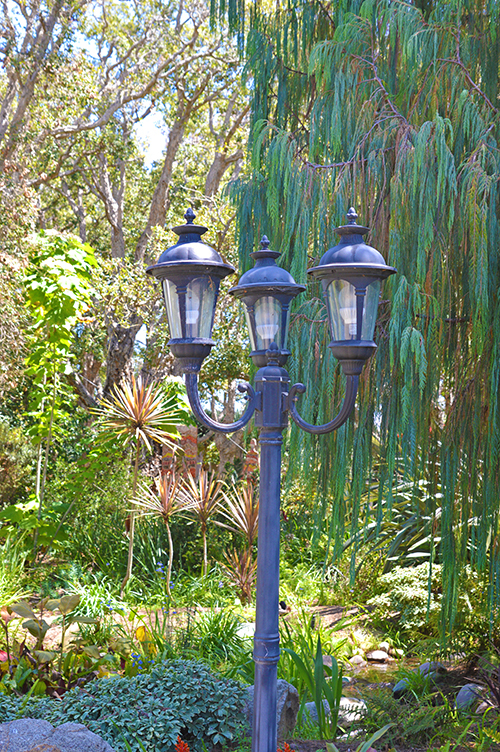 The “>San Diego Botanical Gardens has been a mainstay in Encinitas, California for many years. 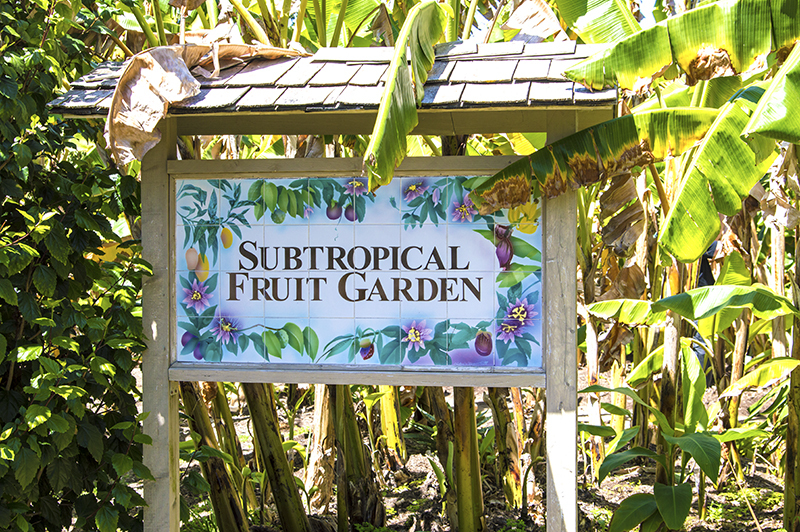 Originally it was called Quail Botanical Gardens but changed its name in 2009 to gain more attention as a regional attraction. We saw an advertisement for an “Art Fest” on social media that caught our eye and decided it was the time to give this place a visit. 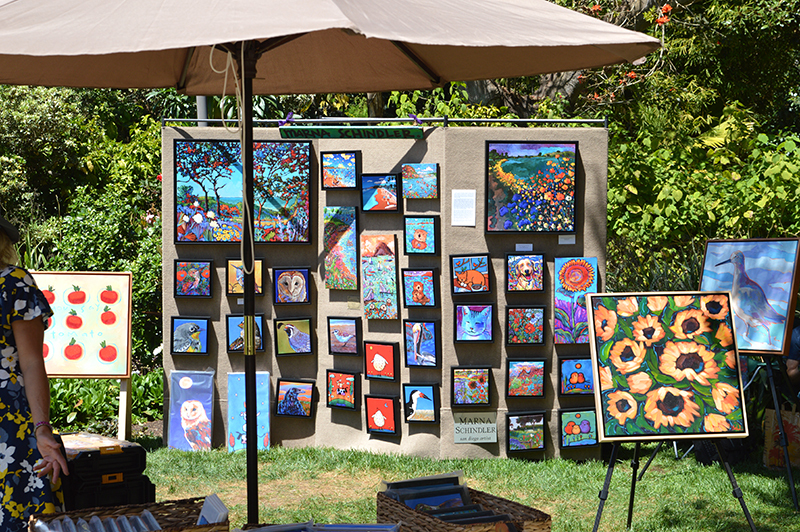 So on a warm Sunday afternoon we decided to check out the San Diego Botanical Gardens and the “Art Fest”. 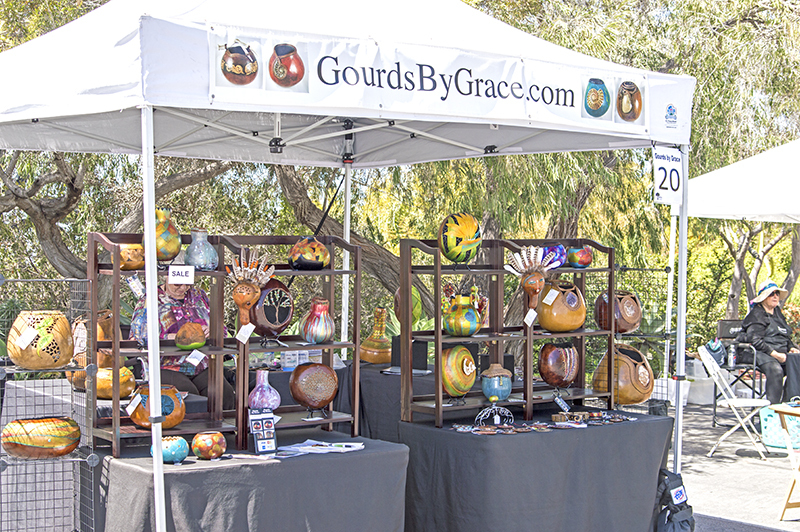 The festival was in full bloom with various booths featuring paintings, photography, sculptures, gourds, wood carving, and various other crafts, all from local artists. 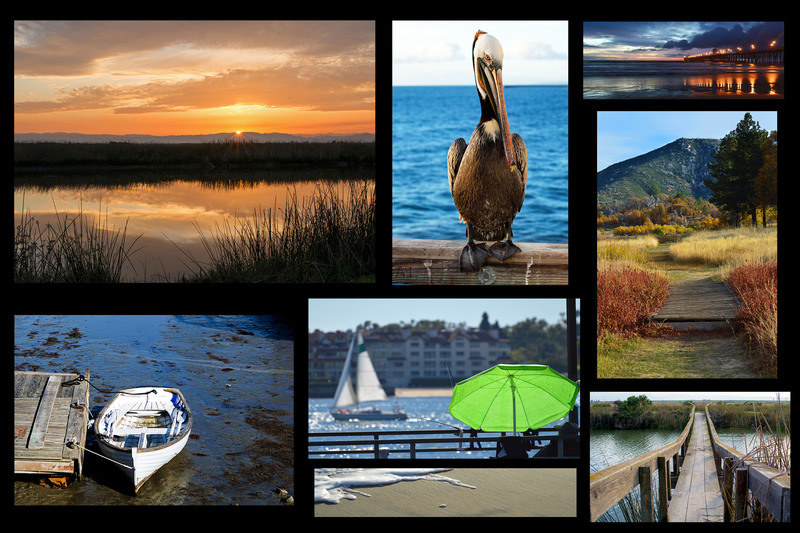 It is always nice seeing what these creative people display and we were not disappointed. As one of our staff members was limited on how far she wanted to go based on a broken ankle, it gave me the opportunity to go off on my own to explore the grounds. 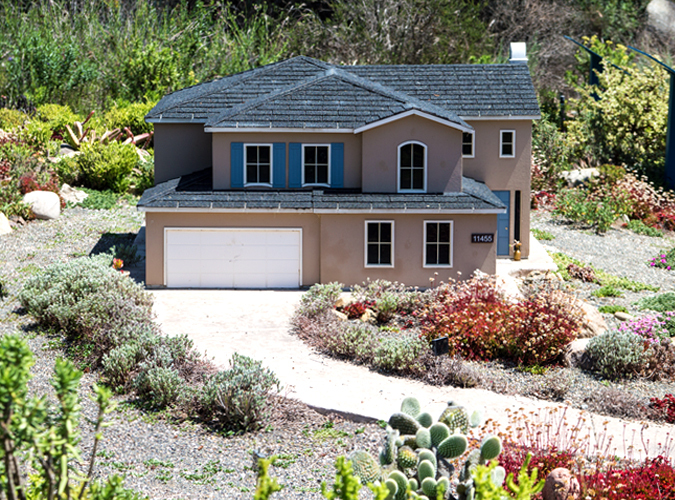 Trails upon trails twist you through twenty nine themed gardens featuring , to name just a few, California native plants, desert gardens, tropical rain forest, succulent gardens, herb gardens, and even one that features fire-safe landscaping, which is perfect if you live in California. 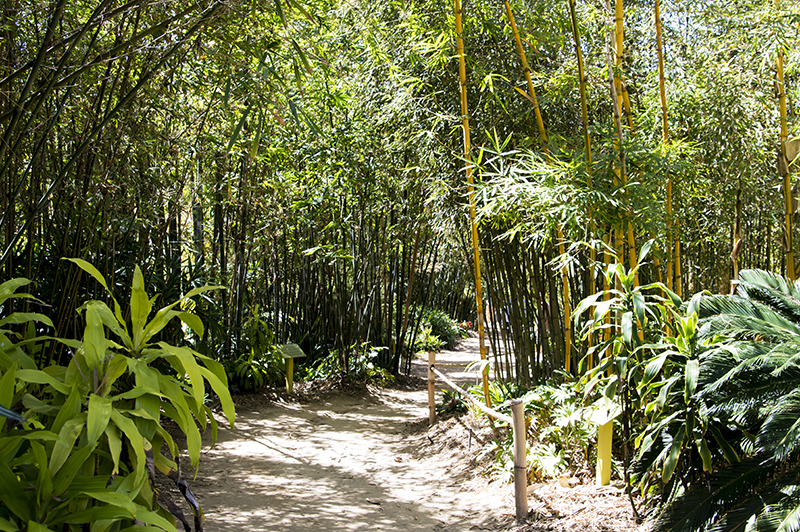 My favorite was the bamboo grove which is said to be the largest collection in the United States. 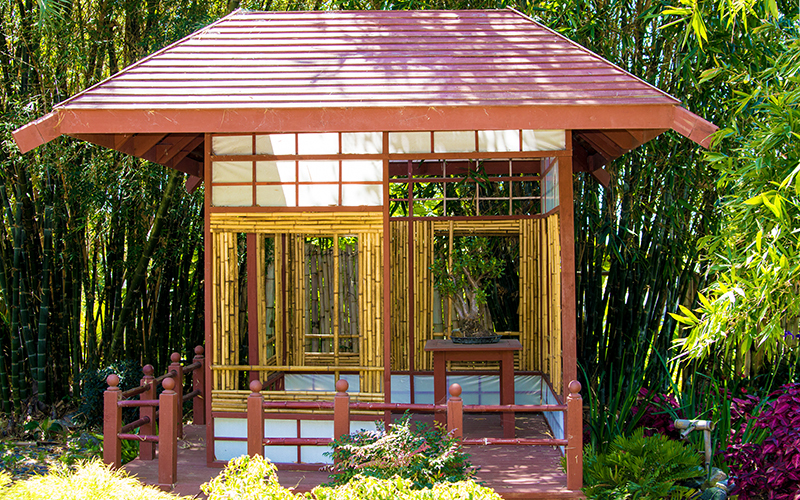 It features some mighty large bamboo pieces with a nifty Japanese hut displayed smack in the middle of the grove. I didn’t realize the gardens would be as hilly as I took off to meander through the grounds. It wasn’t good for staycationer JoJo who had a foot cart to rest her broken ankle. However, along the route I saw people in wheel chairs and walkers, so it couldn’t be all that bad. Still, the art show was the main appeal for her anyway and another friend who also had some walking issues. The hills were actually easy to traverse and where there were stairs, the steps were low and wide, making it super easy to climb. Good thing because I saw a really high look-out tower in the distance and proceeded to make my way in that direction. 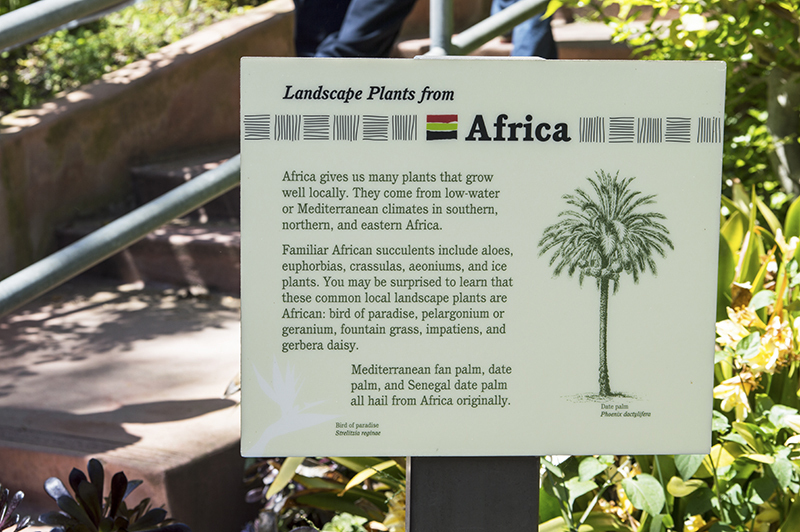 Along the trails, signs point out the various gardens with information about each region and type of flower or plant. Distracted by the subtle hum of water or a stream, I changed direction and headed that way instead. As the sound became louder, I pulled out my camera and was quite surprised to see an impressive three story waterfall. 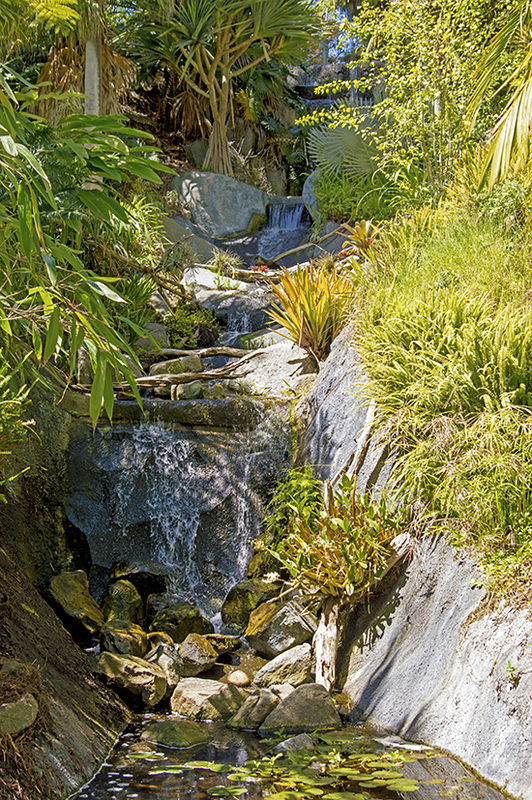 The water cascaded slowly down the rocky slope making this and the shaded areas nearby one of the most tranquil areas on the grounds. 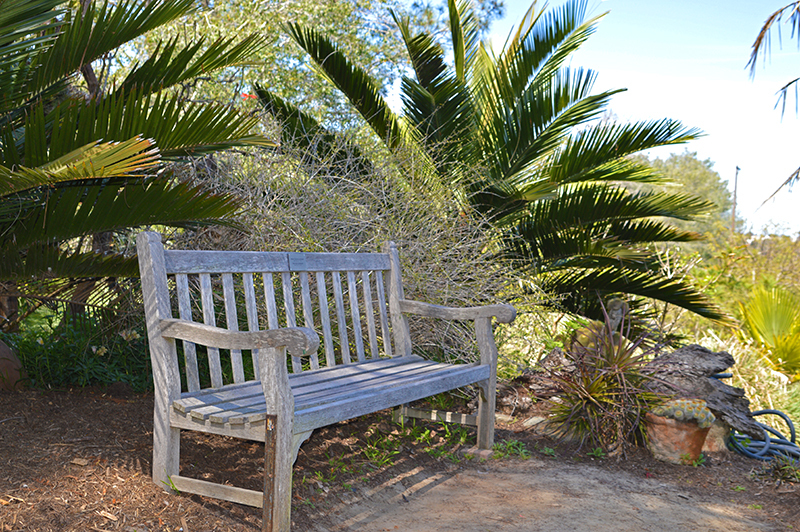 You can also find benches placed along the way to relax and enjoy the scene. 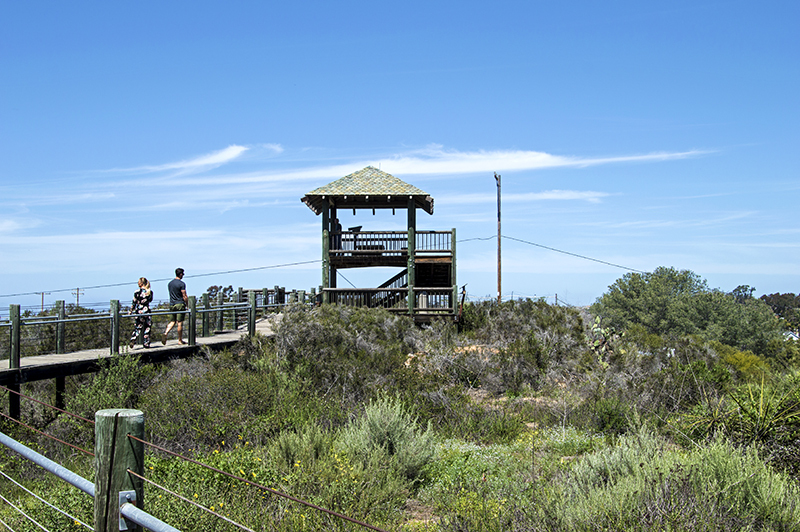 Heading higher now, I make my way to the look-out tower which had an amazing 360 degree view of inland Encinitas plus it was high enough to see all the way up the coast. 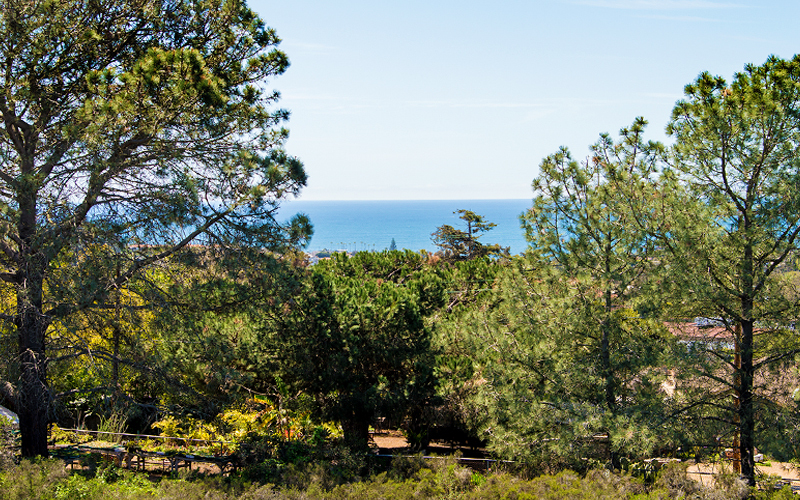 This was just a small portion of the view, you could see more from the other side. I was thinking it was time to get back to my injured guests so I proceeded back down the hill. 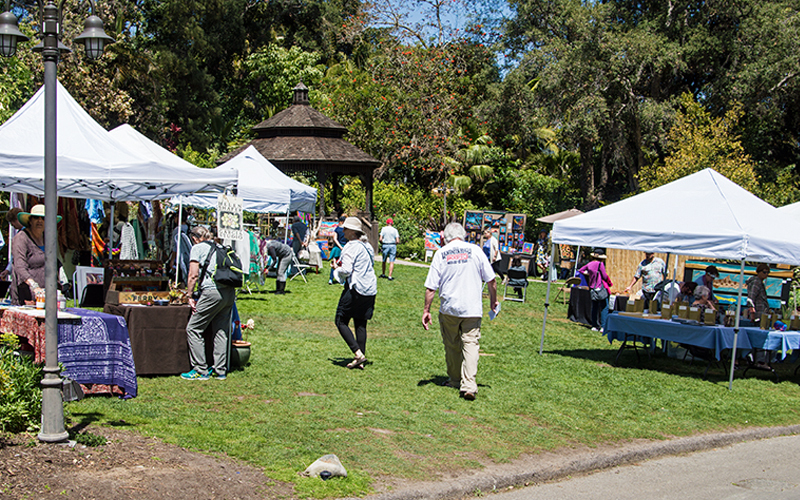 On the way back, I passed by more art booths that were set up in a cute little park area where on stage a gentleman was playing soothing Zen type music. I read later that this park as well as other areas can be rented out for the day for weddings and receptions. Every place like this has to have a gift shop and the San Diego Botanical Gardens is no exception. Nearby, the Feel Good Coffee Cart offers up salads, sandwiches, treats, and of course coffee. Back near my original starting spot I gave one last look around and I noticed a cute little miniature house no more than two feet high. 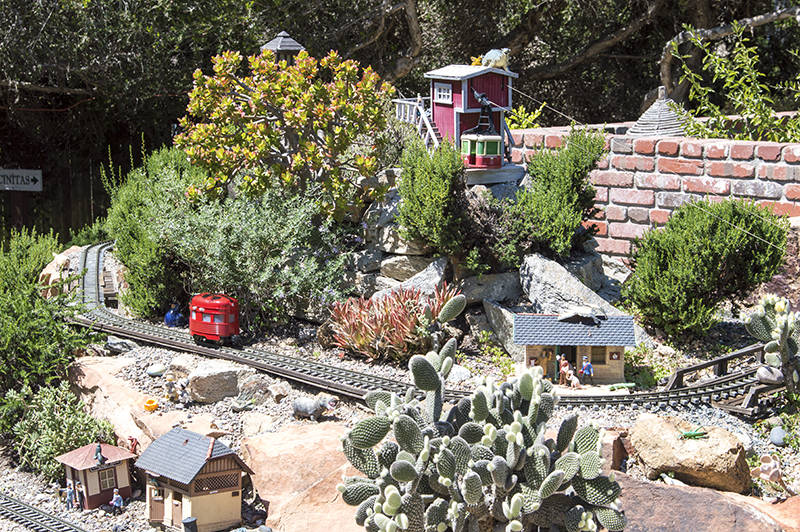 Right around the corner there was also a miniature railroad that the kids seemed to be enjoying. 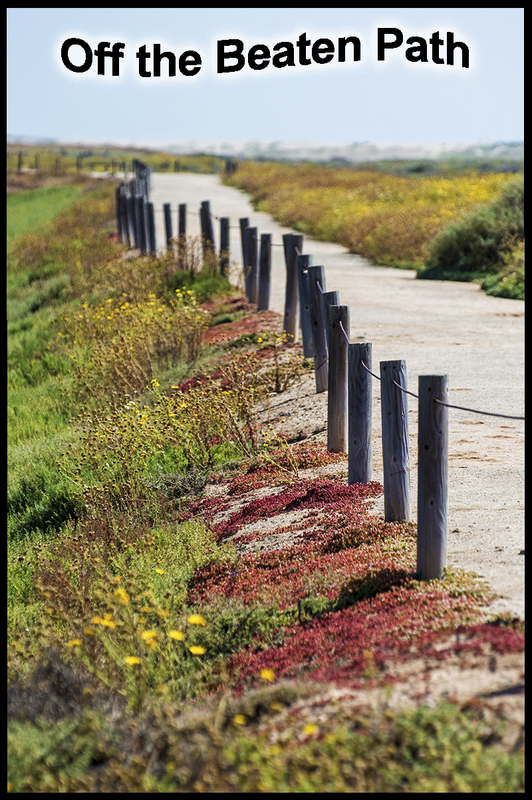 If you love plants and want to see rare and unique species, this is the place for you. 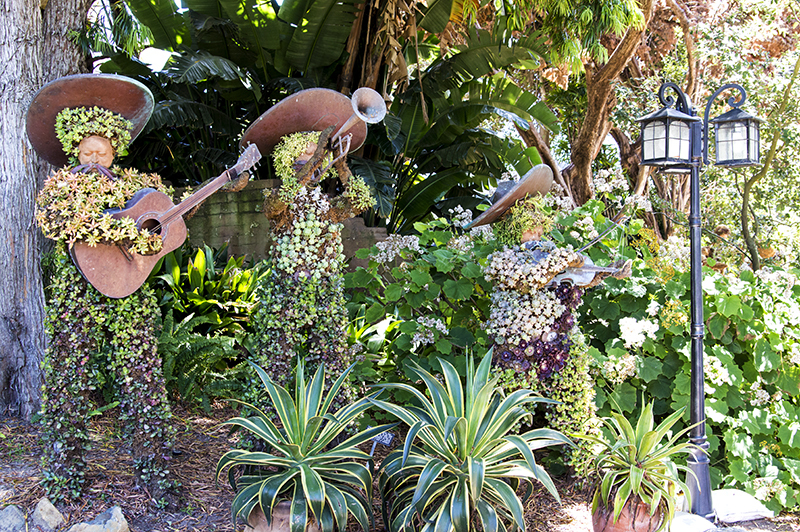 This attraction can take anywhere from one hour to four hours to see depending on how much time you spend visiting each garden. They call a person with the opposite of a green thumb, a black thumb. I always thought I was somewhere in between, even though I may have murdered my poor succulent at home. 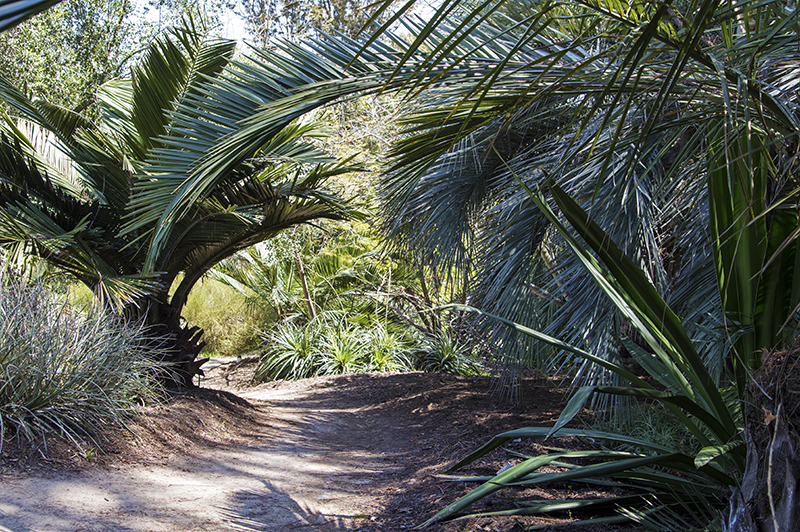 Regardless of your thumb color, if you have a thing for plants, or if you just want to get out for a relaxing day, enjoy a day at San Diego Botanical Gardens. Thank you so much for the pictures and the blog post. I see I missed an interesting sight when I went to visit!